Will a statewide ban on texting-while-driving replace ordinances already on the books in cities across Texas? 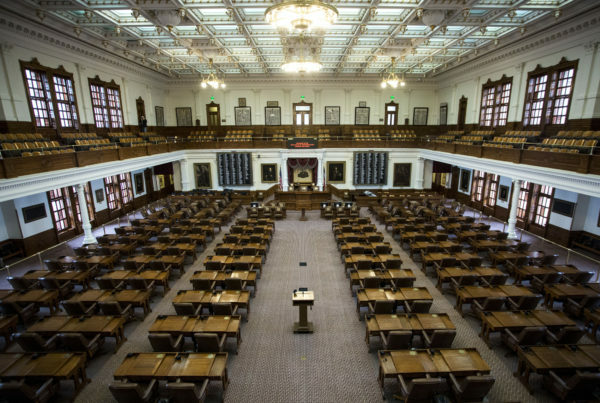 Kathy Sokolic, a 40-year-old realtor from Austin had this question about the state’s legislature’s special session for our our Texas Decides series. She lives about three miles from downtown Austin, in a hip redeveloping area that’s quickly filling with shops, restaurants, families and traffic.“Safety on neighborhood streets is incredibly important to me,” she says. Sokolic’s family lives nearby and last September her nine-year-old nephew was hit by a truck driving past his home. “Apparently the driver wasn’t texting, but this was I mean in a neighborhood in front of a child’s home and he’s severely disabled now,” she says. Sokolic knows distracted driving increases the risk of accidents like these. So she was glad last month when Gov. Greg Abbott signed a statewide ban on texting while driving into law. Then Sokolic heard Abbott announcing a special session, and saying he wasn’t satisfied with how the law was written. “My question was whether the texting ban legislation is going to stay intact during the special session?,” Sokolic says. The short answer is, probably yes. The statewide ban should go into effect on September 1. The long answer is more complicated. Local ordinances that are more strict, like the “hands-free only” driving rules already in place in Austin, El Paso and San Antonio could be in trouble. It all has to do with local control. Many of the items Gov. Abbott says he wants lawmakers to address in the next few weeks would in some way limit local government’s power. “There’s really a struggle over the future of our state with this special session, are we going to continue to grow and progress and have cities that drawing people by the thousands or are we going to put clamps on all of that,” Jeff Coyle says. Coyle is director of government and public affairs for the City of San Antonio. He says cities should have the freedom to decide what drivers do with devices when they’re driving in city limits. Other special session issues of interest to San Antonio and other cities in Texas include the governor’s push to limit when a city can annex an adjacent community and limiting cities ability to set property tax rates. Coyle says the majority of money cities take in from local property taxes goes to pay for public safety needs, like hiring additional police officers or emergency personnel, which are services are things city-dwellers like Emily Hatbermehl appreciate. “In my own personal experience anytime I unfortunately had to call 911, I always got a really quick response,” she says. As Hatbermehl loads her two children in the car before heading to daycare, she explains how Austin’s “hands free” driving rule goes farther than the state’s new ban. Local control critics say it’s gotten out of control. Don Zimmerman is a former Austin city council member and director of the non-profit, anti-tax Travis County Taxpayers Union. “So the local government is chasing its tail with more and more ordinances that raise costs more and more Austin is a mess and if we need adult supervision from the state then so be it,” he says. Who will prevail? City or State? If most lawmakers see it from Zimmerman’s point of view this special session, cities could lose a lot more than the power to tell you to put down that phone when you’re in the car.